Putting up Christmas lights is a fun, festive tradition that families and businesses have celebrated for decades. It's one of the most exciting times of the year as it signifies that the holidays – and all the joy they bring – will soon be here. But if you're not careful with your Christmas light installation, it can also become one of the most stressful and frustrating parts of the holiday season. Far too often, homeowners make very poor decisions when hanging holiday lights and other electrical items on their properties. While their intentions are good, they do not heed the warnings printed on the labels. Too many strands of lights are connected to each other. Improper extension cords are used. Wires are left outside, exposed to rain and snow. All of these scenarios pose very serious fire risks. Even if you only have a few strands of lights on some small bushes in your front yard, you could unknowingly cause a fire if the lights are producing too much wattage. This is why it's so important to get professional help with your holiday lighting installation! Play it safe this holiday by seeking the help of the Christmas Lights Specialist. We are professional electricians who specialize in Christmas light installation for homes and businesses in Dallas, Texas, and surrounding areas. As electrical contractors, we know how to make your lighting safe and up to code. We can help you design and install a beautiful holiday lighting arrangement, no matter what the scale or scope. In addition to having a gorgeous display that will wow your neighbors, you'll have peace of mind knowing that your lights are completely safe. Plus, we perform all the installation ourselves, so you don't have to worry about getting on your roof or climbing dangerous ladders. We'll handle everything for you, from start to finish. 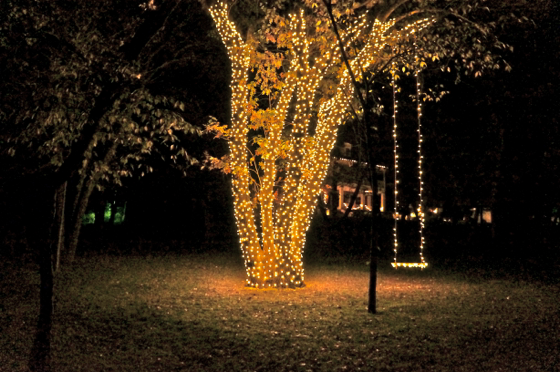 Call (888) 377-1363 to get a free estimate for your holiday lighting installation.